While Postino (pictured), one the Valley’s favorite spots to hang out for a spell, doesn’t have a traditional happy hours, wine by the glass or pitchers of beer are $5 from open to 5 p.m., seven days a week. 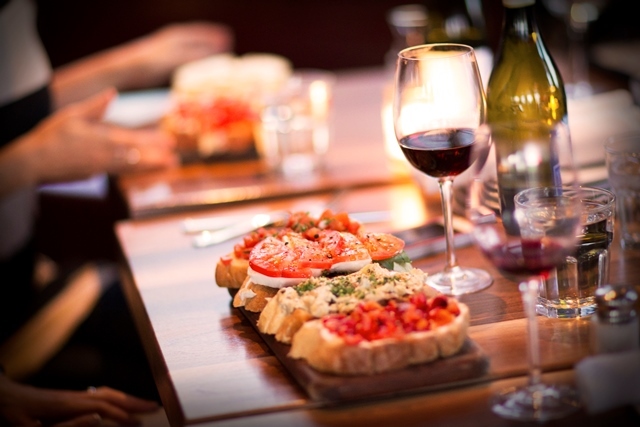 Plus, stop by Mondays or Tuesdays after 8 p.m. for a bottle of house wine and a bruschetta board for $20. At Chandler’s Vintage 95 Wine Lounge, visit daily from 3 to 6 p.m. and nightly from 9 to 10 p.m. for delish happy hour specials, like $5 select craft cocktails and select glasses of wine, and an array of small bites for $5 or $8. Plus, select bottles of red or white are only $20. It pays to pop into The Living Room at Market Street at DC Ranch on a weekday. From 3 to 6 p.m., the restaurant serves up food specials, while the drink happy hour menu lasts a while longer, from 11 a.m. to 6 p.m. For as little as $2, savor oysters on the half shell, edamame, mixed nuts and much more. Every day from 3 to 6 p.m., Rhythm & Wine in Scottsdale offers $3 glasses of wine, as well as discounted cocktails and beers. Hungry? For $5 to $9, the restaurant offers a wide selection of bites like street tacos, jumbo meatballs, flatbreads and more. Monday through Friday, from 3 to 6 p.m., Sorso Wine Room has two for one glasses of house pour wines, half off bottles of house pour wines, two for one draft beers, and great deals on delicious eats (like three bruschetta for $10). At Old Town’s 5th & Wine, save the date for Monday nights as the restaurant offers half off all bottles of wine after 6 p.m. until close. Timo Wine Bar is Phoenix offers an array of weekly specials to make it through until Friday. On Sunday, enjoy Italian night from 5:3o to 9 p.m. for a lasagna and a bottle of wine to share; on Monday, date night means an oven-fresh pizza and a bottle of wine for a great deal. At its three Valley locations, La Bocca Urban Kitchen + Wine Bar offers happy hour daily from 3 to 6:30 p.m. In addition to having more than 100 wines in house, there are daily wine-board specials, and house-made red and white sangria and seasonal cellos.